If images aren’t displaying on the page, please click on the little icons to open the images in a separate window. Records show that Timothy Stearns bought a large tract of land here in 1723. The cellar hole from his house is where our sheds are now located. Stearns’ daughter married Col. Nixon and their son, Capt. 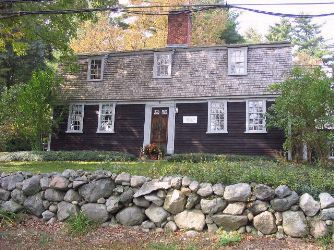 Thomas Nixon, Jr. built the house, c. 1787, across the road, that still stands. The land remained in the Nixon family until Margaret Welch assumed ownership in the early 1900’s. 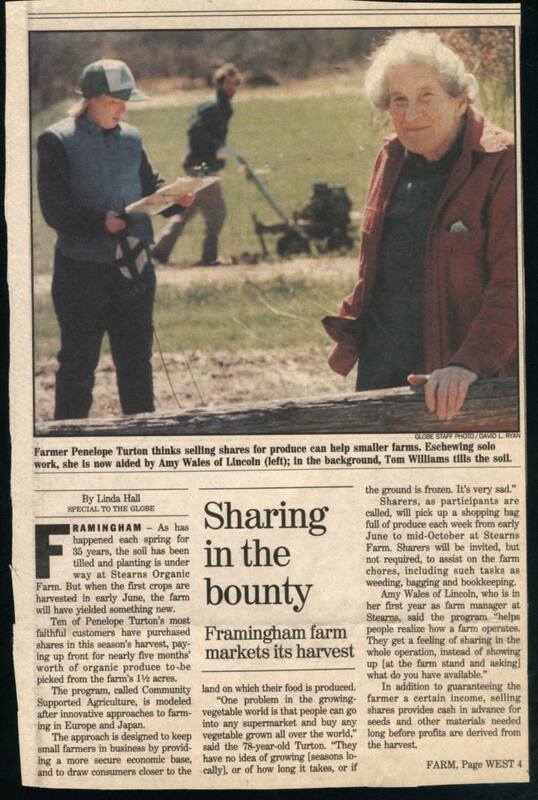 Penelope Turton, an English friend of Mrs. Welch, founded Stearns Organic Farm in 1954, and farmed it until 1990. 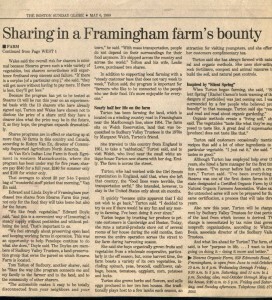 The ten acres of farmland and an additional 70 acres that adjoin Callahan State Park were given to Sudbury Valley Trustees (SVT) in 1975 by Mrs. Welch. 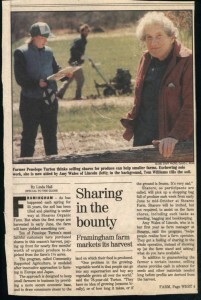 In 1990, Penelope started a CSA as part of Stearns Farm in addition to the regular farmstand. There were ten shares that year. 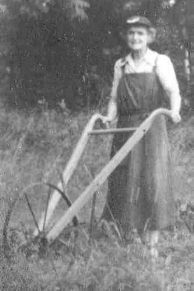 Amy Wales was the first farm manager for the new CSA and it was the first time Penelope had ever delegated that task to anyone. Clicking on the two images to the left will show larger, readable versions of a Boston Globe article about that time. 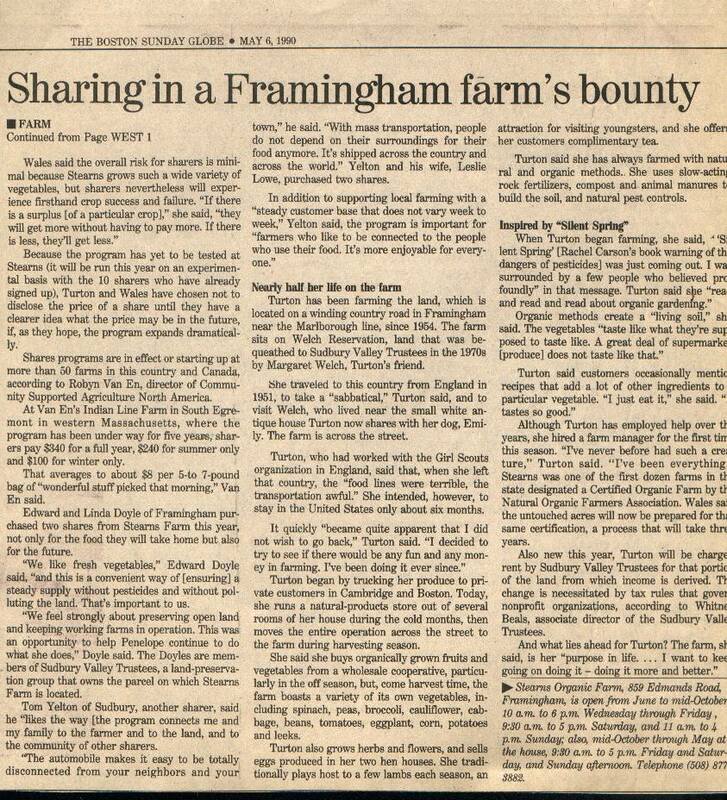 In 1994 “Stearns Organic Farm CSA” incorporated as a non-profit organization. Since then it has been governed by a sharer-elected Board of Directors. Since the USDA Organic Standards went into effect October 2002, we no longer use the word “organic” to describe Stearns Farm produce. The certification process that would allows us to use the “organic” label is prohibitively expensive for us, but our farming practices remain organic, entirely natural, and sustainable. We use no chemical fertilizers or pesticides.